PHP scripts mall provides you the ready-made matrimonial PHP script. Matrimonial website is one of the profitable online businesses for the past decade. 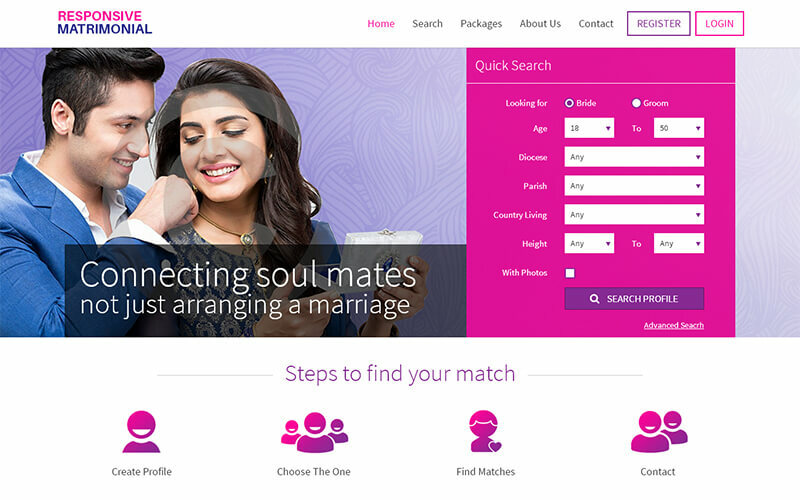 This responsive matrimonial script is developed because our company is inspired by other matrimonial websites like Bharat matrimony, shaadi.com, jeevansathi.com; even then our script is distinctive from other matrimonial websites. We understand that matrimonial script is one of the challenging parts, so we offer the script in five different methodologies since the user explores their bride/groom in different ways. If you purchase the PHP Matrimonial Website Script from us, you don’t have to pay single penny for the upcoming year since our backend talented team of 40 members team will be available 24*7 to assist you and sort out the technical issues you face. We know that the entrepreneurs may not have knowledge or time to update the website or regular intervals, so the management decided to provide free updates for 6 months. So you need not worry about the issues. One of the astonishing things is that, once you purchase the marriage match making script from us the website will be live within 24 hours. Our script enhances user friendly navigations, durable admin, with high security and clear code facility. Our mobile responsive design ensures your matrimony site and gives the best experience to look in desktop, tablets, smart phones etc. You can earn extensively with the Google ads, banner ads and different subscription models. We develop in such a manner that the page loads faster even if the internet connection is low. Responsive Matrimonial can be customized by all religion communities by changing the homepage banners, categories and sub-categories through the admin. Less technical knowledge is required to use this software. The members can easily search their matches based on their expectations. WHY SHOULD YOU BUY OUR SCRIPT? Our experience in this field is about 14 years, we provide you technical support for 1 year at free of cost. Up to 6 months, based on the company’s strategy we update the scripts. For us client is the king and we proudly say that all over the world we are the only company providing these offers. We provide free installation and maintenance by our backend development team. We have a pre-built payment gateway integration. View and manage profile detail. We also provide 1 year of technical support, free updates for the source code for 6 months. We will provide you with the full source code upon purchase of the script. If you still have any queries, feel free to contact us. We would be glad to help. I was able to do my online business in my tab itself which is a great advantage. The developers are freak and friendly. They answered all my questions very easily and with patience. It’s a pleasure for me to write my views about this script. I suggest everyone to purchase this script and get benefitted. This script is absolutely beautiful and it’s pretty easy to customize I’m always buying this script for a bunch of different projects but this one is my absolute favorite so far and the support is amazing!